This is a color mosaic of Tropical Cyclone Gita created using images acquired from the ISS on February 13, 2018. These images have been reprojected to approximate an overhead view before creating this mosaic which covers an area of 1,500 kilometers by 1,000 kilometers. Note that this southern hemisphere storm rotates in the opposite direction of the more familiar storms in the northern hemisphere. 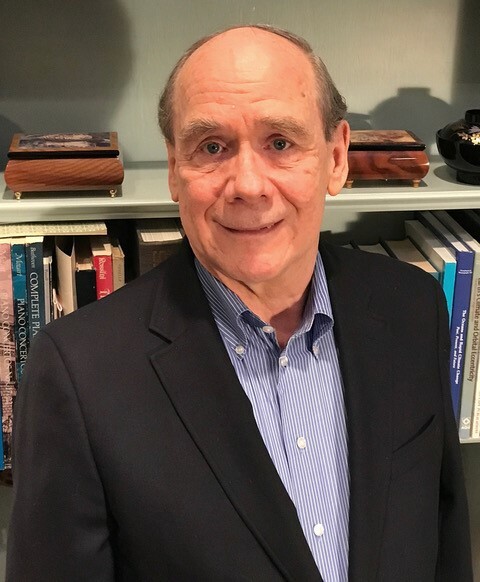 Paul C. Joss, professor of physics emeritus at the Massachusetts Institute of Technology (MIT), is the principal investigator of an International Space Station (ISS) National Lab project focused on tropical cyclones, which are also called hurricanes and typhoons. But atmospheric physics is not Joss’ only research focus. He also conducts research on the theory of neutron stars, supernovae, and binary star systems. Currently, he is investigating a promising new model for the origin of many cosmic gamma-ray bursts, a mysterious phenomenon that has puzzled astrophysicists for the past 45 years. He is also calculating the processes leading up to the formation of a hypernova—from the evolution and merger of a pair of massive stars in a binary system to the hypernova explosion that the merger eventually produces. 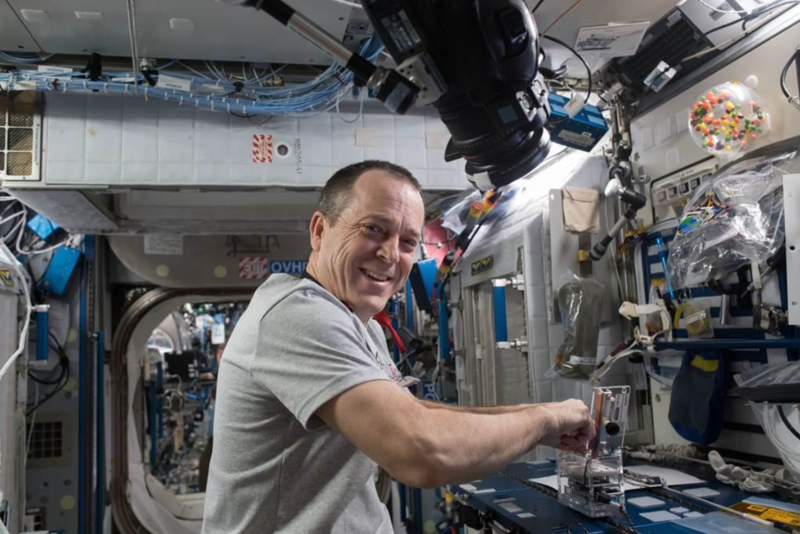 Joss’ ISS National Lab project, the Cyclone Intensity Measurements from the ISS (CyMISS) project by Visidyne, Inc., aims to use the unique vantage point of the ISS in low Earth orbit to improve measurements of the intensity and trajectory of tropical cyclones. To develop the new technologies needed to measure tropical cyclones worldwide, the CyMISS team started a commercial spinoff company called Trans World Analytics, Inc. (TWAI) in 2016. 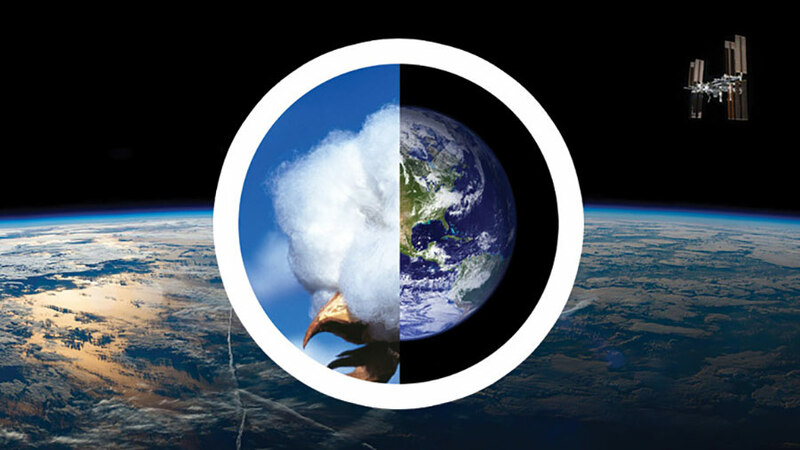 The company’s eventual goal is to use microsatellites to advance worldwide knowledge about tropical cyclones. We recently asked Joss about his thoughts on tropical cyclones and his work to improve forecasts of the strength and track of these devastating storms. My whole life, I’ve always been interested in atmospheric physics. Dr. A.T. Stair and I, along with my MIT colleague and leading hurricane expert, Dr. Kerry Emanuel, had an opportunity in the 1990s to develop a new space-based method for remotely measuring the intensities of tropical cyclones as part of a collaborative project between the U.S. and the Russian Republic. It was a great project that was sadly canceled due to international political issues in the 2000s. The heat contained in the waters of the Earth’s tropical and subtropical oceans is the fuel that drives tropical cyclones. There’s always somewhere in the world where these storms are living out their lives. 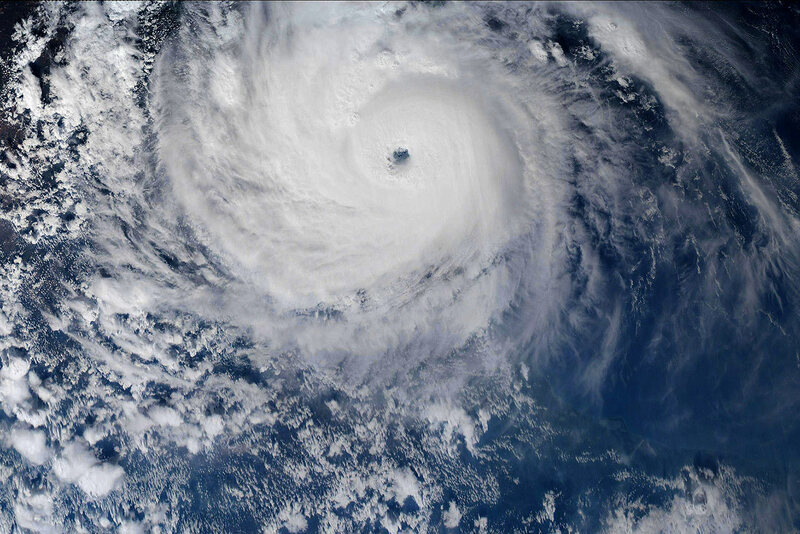 In the Northern Hemisphere, tropical cyclones occur in the summer and fall. In the Southern Hemisphere, the storms are active in our winter and spring, which are the summer-fall seasons south of the Equator. It’s a year-round thing. Katrina’s record in terms of property damage by a natural disaster was recently broken by Harvey in August 2017, with $199 billion in damage, primarily in Texas. That’s the second costliest disaster in world history, beaten only by the 2011 earthquake and tsunami in Tohoku, Japan. Hurricane Katrina in 2005 caused losses of $108 billion along the U.S. Gulf Coast. In 2012, Hurricane Sandy caused $71 billion, mostly across the northeastern U.S. The Great Galveston Hurricane in 1900 killed an estimated 6,000-12,000 people. It was the worst natural disaster in U.S. history in terms of loss of life. Most of the property damage and loss of life are caused by the storm surge. Not the ferocious winds. Not the torrential rainfall and freshwater flooding. So the best measure of a storm’s intensity, in terms of its true destructive power, is the strength of its surge, which is governed by a combination of the storm’s peak winds and the areal coverage of those winds. It’s this yardstick for intensity that we seek to measure. A good example was Hurricane Sandy in 2012. When it struck the northeastern U.S., Sandy was only a minimal hurricane in terms of its peak winds. But its wind field was extremely large and blew over an enormous fetch of ocean water, piling up an immense surge that devastated portions of New York City and the entire New Jersey coastline. Hurricane Irma this past year was first forecast to track along Florida’s eastern coastline, then later forecast to travel up the Gulf coast. In the end, it tracked right up the middle of the Florida peninsula. The more we know about tropical cyclones, the better we’ll be able to forecast these storms and give people timely and accurate warnings. Because only the United States has the resources to fly hurricane hunter aircraft into these storms, only the U.S and nearby countries benefit from the accurate storm measurements that hurricane hunters can make. We only need a constellation of four to eight microsatellites to monitor all tropical cyclones worldwide. 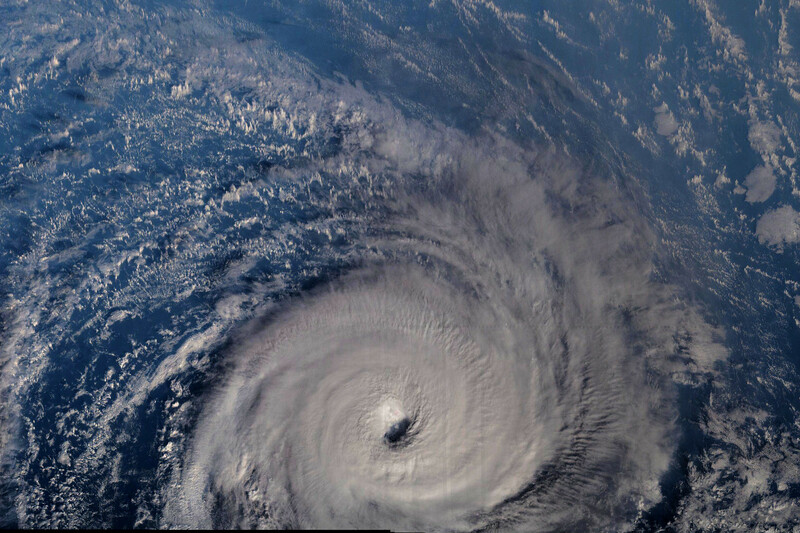 Our satellite constellation in low Earth orbit would provide accurate measurements of storm intensities worldwide, information currently available only in and near the U.S. Every 1.5 hours, one of the satellites will pass close enough to every tropical cyclone located between 40 degrees south and 40 degrees north latitudes to accurately measure the intensity of the storm. At higher latitudes, the storms pass over cooler ocean waters and rapidly lose their identities. 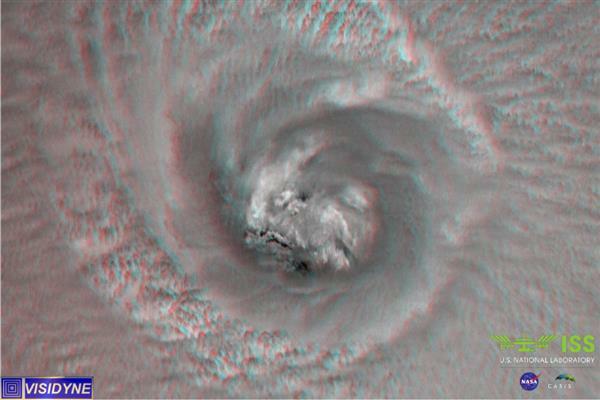 We need very high-resolution images of the cloud tops near the center of the storm. We need to measure the altitudes of the clouds to an accuracy of 100 meters and the cloud temperatures on equally small scales. 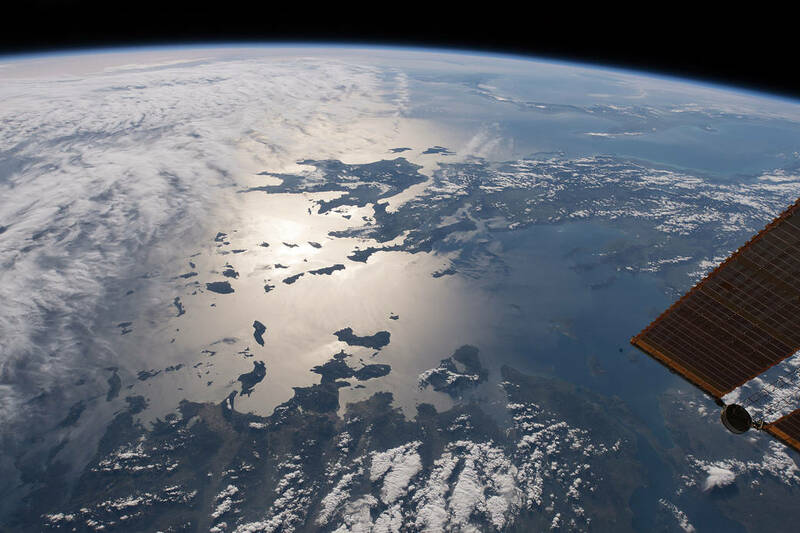 That requires very high-resolution images from the distances, up to 2,000 kilometers, from which our satellites will be taking their measurements. 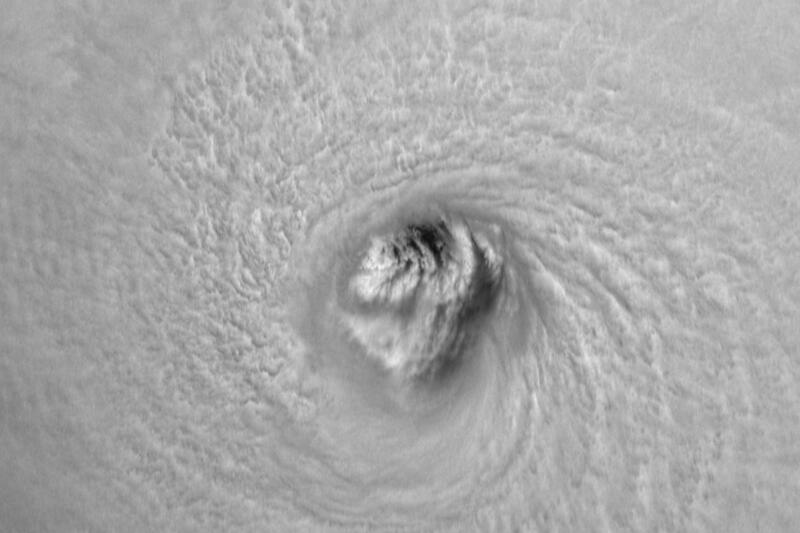 A black-and-white closeup of the eye of Hurricane Irma taken from the ISS on September 5, 2017. It’s not our intent to replace hurricane hunter aircraft. These flights usually aren’t sent out more often than once every 6 hours. We’ll measure the intensity of a storm every 1.5 hours. That will improve real-time knowledge of a storm’s intensity, which will lead to improved forecasts of the storm’s strength and track. There are no hurricane hunter aircraft for tropical cyclones in the western Pacific and Indian Oceans. Advance warnings of impending storms are relatively crude. With our technology, loss of life could be reduced by about 50% and property damage reduced by something like 30%. It’s still important to monitor the intensities of storms in parts of the world with no human populations. Monitoring places such as the southern Indian Ocean will give us a better understanding of the critical role these storms play in the Earth’s climate.